3-minute previews of all tracks of the Bismuth album. BISMUTH (selected ambient hybrids) is a Limited Edition  CD-box; composed, performed, recorded & mastered by Guy Drieghe-D. in 2014. For analog electronics, hybrid effects, and a Tibetan horn (2014). Studio reenactment of a live performance in "Het Bos", 19 Sept '14, Antwerp. For grand piano, prepared piano, electronics, and digital processors (ca. 1981). Restored from cassette tape, digitally enhanced during re-mastering. For coloratura soprano and electronics (1983). Remastered from cassette tape; noise & hum removed, but mostly untouched. Soprano: Rolande Van Der Paal. Avant-garde electronic music composition, appr. 1985. Remastered from cassette tape (some noise is audible). Performed on Synthi AKS, ARP 2600, and other synths. Avant-garde electronic music composition, 2012. A small excerpt from the upcoming album "Per Endula". Per Endula consists of three Acts. This sample is from Act One. The album is expected to be released in January 2013. Performed on the STCFTHOTS analogue modular system. Avant-garde electronic music composition, 1985. Performed on the Aemit modular synthesizer, recorded digitally on PCM tape. In 2014 I designed & developed a so-called breakout expander box for my two Buchla (BEMI) Easels. The Twin-Easel Model 644 Interface sits between a fully-fledged Easel (Stored Program Sound Source Model 208 + Touch Activated Voltage Source Model 218) and another Model 208 (sans keyboard). It allows communication and patchboard interchange between the two machines through a newly developed custom Program Card, which sends and receives analog data over two 40-pin flat ribbon connectors. The Model 644 Interface doubles all of the standard CV inputs on each Easel (Pitch, Timbre, Period, LPG Levels, etc), and adds extra CV control over the Envelope's Attack, Sustain & Decay parameters, as well as CV control over the Sequencer's number of steps. The 208's Sequencer has pulse outputs for each step, and Envelope, Pulser & Keyboard I/O pulses are available as well. Additionally - and most importantly - the Model 644 Interface turns the Easels into stereo synths, with voltage-controlled panning (through vactrol circuits), independent for each Easel. Two built-in comparators can generate Easel pulses from any source, allowing for full timing synchronicity between the two Easels, and/or any other external machine. The Model 644 front panel is laid out so that most CV/Pulse outputs from one Easel are only a shorting-bar away from the CV/Pulse inputs from the other Easel (cross-patching). 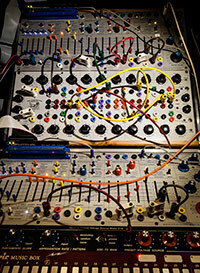 The custom Program Card still accepts regular Buchla Program Cards. From early 2009 until 2011 I have build my own analog modular synthesizer system, based on 30-yo original Serge technology, Buchla clones, and some other modules I designed myself. It shares the look & feel of typical Serge/STS systems, and is housed in four semi-portable cabinets containing four 19" panels each. The stcfthots system contains about 150 separate function blocks. It has 9 oscillators, 7 filters (various kinds), 4 resonant lopass gates, 4 sequencers/programmers, and 20 VC slope generators. Amongst the more esoteric modules are a frequency shifter, extended source of uncertainty, modulo processor, harmony generator, and a 10-stage VC vactrol phaser. Randomness is generated by a choice of 11 dedicated modules. Tactile interfaces include a ribbon controller, pressure-sensitive resistive sensors, joysticks, and a contact mic with a velocity-to-midi interface. The system talks to the outside world via two midi-to-CV/Gate interfaces, and communicates with my DAW via a DC-coupled audio interface. I often use a microphone with an envelope follower and Schmitt trigger to control various parameters of the synth; a pitch follower is used as well. ... and many more performances and live concerts. 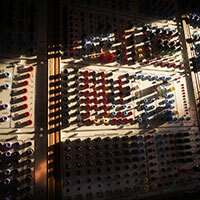 Workshops & courses with Andre Stordeur, Morton Subotnick, John Cage, Eric Feremans, John Beyls. I have also conducted synthesis & musique-concrete workshops myself, for which I wrote several booklets and courses about synthesis techniques. Occupation: graphic designer, visual-database designer, photography & web design. Education: art school; painting & sculpting. I am available for performances in select small venues or art-galleries. Also open to collaborations with other like-minded artists, preferably classically-schooled traditional or ethnic acoustic instrumentalists.